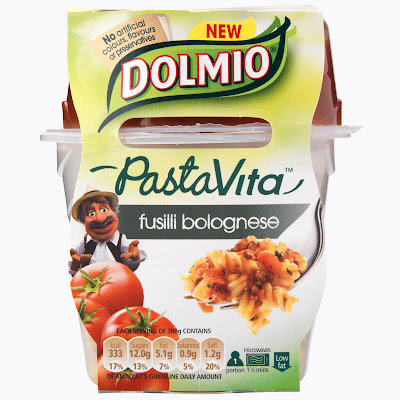 This new microwavable meal from Dolmio comes in two recyclable plastic pots, one small and one large pot, like the Little and Large of Ready Meals, although apparently they preferred a curry before each gig. The smaller pot is filled with a deep red sweet pepper sauce, and the larger pot filled with Fusilli pasta. Both pots weigh 300g in total, and are a healthy 327 calories. With one hundred percent natural ingredients, this meal is equivalent to one of the five daily intakes of fruit and vegetables, although I’m unsure if this is dependent on the size of the person, as it could be two of the five for Syd Little. The ingredients include tomatoes, yellow pepper, onions, lemon juice, parsley, red pepper and garlic. I read the instructions on the cardboard sleeve and found both pots had been steam sealed for better taste. I pealed back each pot lid a quarter open before placing them both in the microwave for one and a half minutes. I was a bit worried when I read that the smaller pot had to be tipped into the larger pot once heated. Visions of Laurel and Hardy sprang to mind, with red sweet pepper sauce flying in all directions and another fine mess I’d got myself into. Even though the two plastic pots were quite hot from the microwave, fortunately I didn’t spray pasta and sauce everywhere. I dropped the empty smaller pot into the sink and left the pasta and sauce filled larger pot to cool. I noticed the dark red sauce soaked in with the pasta quickly and the meal didn’t require much stirring. I dumped some Walker’s Cheddar Cheese and Bacon crisps into a bowl and had some bread on the side for dipping into the pasta sauce. I watched the 1939 version of Jesse James and nearly choked on a mouthful of red sauce covered Fusilli when I found the film was in colour! Jesse James was played by Tyrone Power, supported by a very young Henry Fonda and Randolph Scott. Although there wasn’t much action, it was a great movie, amusing in places, well written and acted. I thought about adding some cheese on the top of the meal and some black pepper, but on first taste I decided to eat the meal straight to enjoy the full flavour of the pasta and sweet pepper sauce. I certainly didn’t regret my decision and really enjoyed the pasta meal during the film. The Cheddar Cheese and Bacon crisps complemented the tasty tomato and sweet pepper sauce very well. The sauce had a full tomato flavour to it, with a hint of sweet chilli heat from the peppers, and a mention of parsley and garlic in the aftertaste. Although I found this meal very filling, my only disappointment was when I’d emptied the whole plastic pot, but I couldn’t help mopping up the remains of the sauce with the leftover bread. I look forward to having this flavoursome pasta pot again and reckon Little and Large would forgo their usual curry for this meal. Although, I don’t know if they like pasta… and apparently they haven’t spoken in years… must have been one bad curry too many?